Villa Vista Mar - Luxury house with fantastic sea view. 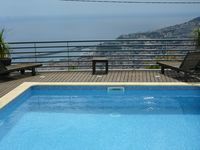 Property 76: Villa Vista Mar - Luxury house with fantastic sea view. The hosts were awesome and the house is well equipped for a great vacation! The views are spectacular! Amazing house in perfect location! This house in Madeira was the perfect size for a group of 6 people in the perfect location. While is was slightly outside the city center, it was still extremely accessible to anywhere you wanted to go in Madeira. The layout of the house flowed very nicely- with substantial size rooms and a great kitchen, and family/ living room. The view from the upstairs room was breathtaking and such a surprise to wake up to every morning. My family and I very much enjoyed spending our holiday in this home away from home and we would certainly rent it again!